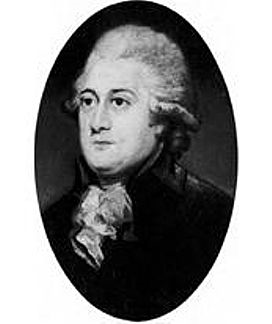 One of the most prominent eighteenth century anti-slavery campaigners was Thomas Clarkson. A strenuous protagonist, he co-founded The Society for the Abolition of the Slave Trade and helped to achieve the passage of the Slave Trade Act of 1807, which ended British trade in slaves. This article recounts his special contribution to English social history. Thomas Clarkson was born in Wisbech on 28th March 1760, the son of an headmaster. His father died when he was six years old and he was raised by his mother. He attended his local grammar school and later went to St Paul’s School in London, before matriculating at St. John’s College, Cambridge, in 1779. It would appear that this red haired man, who stood over six feet tall, was destined for an academic or clerical career. However, whilst he was at University he entered an essay competition entitled Is it lawful to enslave others against their will? His research for this essay was to change his life completely. He decided to travel to London to get his work published. On his journey from Cambridge, he stopped to rest his horse halfway down a hill on the approach to the small Hertfordshire village of Wadesmill. ‘A thought came into my mind,’ he wrote, ‘that if the contents of the Essay were true, it was time some person should see these calamities to their end’. That person was to be himself. Having been ordained deacon, he never sought to become a priest, but instead devoted his life to the abolition of the slave trade and of slavery itself. Nobody worked harder than he to overthrow slavery. Clarkson had tireless energy and hated injustice. With the support of Quakers, and other nonconformists, he co-founded the Committee for the Abolition of the Slave Trade in May 1787. He approached the young William Wilberforce for support who, as an Evangelical Christian, was one of very few parliamentarians to have had sympathy with an earlier Quaker petition. His efforts were crucial to the anti-slavery campaign. Working with a small group of other abolitionists, including John Wesley and Josiah Wedgewood, he travelled all over the country, to major seaports especially Bristol and Liverpool, a major base of slave trading syndicates, to seek first-hand evidence of the facts and horrors of slavery. He interviewed thousands of sailors and other people involved in the slave trade sometimes at great personal risk. Even so, he was able to persuade some to give eye-witness accounts of the suffering that slaves endured. It was Clarkson’s detailed evidence, presented to Parliament over several years by his fellow-abolitionist Wilberforce, which eventually led to the abolition of the slave trade in 1807, and of slavery throughout the British dominions in 1833. Clarkson was the first president of the world’s first human rights organisation, the British and Foreign Anti-Slavery Society, now called Anti-Slavery International. He retired to Ipswich where he died on 26th September in 1846, and was buried quietly as was his wish. 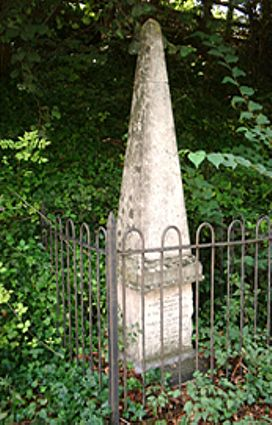 The poet Coleridge paid a fitting tribute to him: ‘He, if ever human being did it, listened exclusively to his conscience, and obeyed its voice.’ In 1879 a stone memorial, which still stands today, was erected at the exact place along Old North Road, now the A10, where Clarkson paused outside Wadesmill. 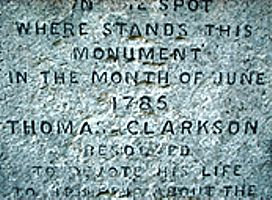 It reads: ‘On this spot where stands this monument in the month of June 1785 Thomas Clarkson resolved to devote his life to bringing about the abolition of the slave trade.’ In 1996, the 150th anniversary of his death, a monument to him and seven other abolitionists was unveiled in Westminster Abbey.